The Shaolin Temple Quanfa Institute has brought together 14 athletes into Shaolin Team Canada, to compete in the international Shaolin kung fu competition in China in October. Raphael Riding shouts between kicks. He sways, jumps and punches, practising for his upcoming competition. But he's not just any athlete, and the event he's getting ready for isn't just any tournament. In October, Raphael will be in China, competing for the first time along with more than 2,000 athletes from 50 countries in the Zhengzhou China International Shaolin Wushu Festival. 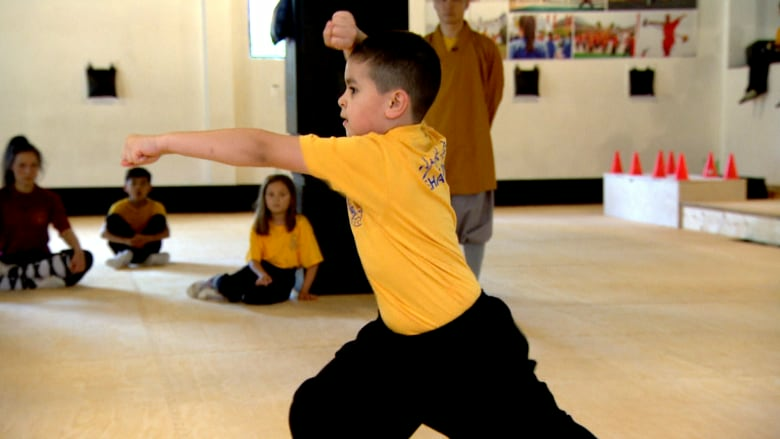 Oh, and by the way, he's only eight years old — and has been training in the Shaolin martial arts for half his life already. The student at Toronto's Shaolin Temple Quanfa Institute is both excited and nervous. "I might perform in front of 1,000 people," he said. But he's also confident, saying he's expecting to walk away from the competition with a gold medal. The institute, a Shaolin kung fu school with branches in Toronto and Markham, is taking 14 students ranging in age from eight to 47 to the competition, forming the Shaolin Team Canada. Raphael, who is the youngest member of the team, will be competing solo in his favourite form, Tong Bi Quan, a quick sequence of kicks, punches and jumps. "We need to put Canada on the map with all these other countries of the world that are showcasing their talent in Shaolin kung fu martial arts," said Dao Shi, the head coach for Shaolin Team Canada. The Shaolin festival is held in the city of Zhengzhou​, which is near the famous Shaolin Temple. The athletes compete in a variety of kung fu moves and sequences called forms. Shi says Shaolin is unique because anyone, regardless of age, can participate and do well. Shaolin was made famous in the west by the late actor Bruce Lee and the movie Kung Fu Panda. It combines kung fu with meditation and the practising of virtues such as focus and perseverance. It's more than 1,500 years old, and according to Shi, each move has a purpose in self-defence. "We don't do fancy flips in the air. What we're trying to do is display power and effectiveness in the movements, and that's why we train them," said Shi. Some of Shi's most impressive moves take lots of time to prepare for. He spends minutes in meditation, breathing deeply and making slow movements with his arms before he takes a iron bar and breaks it with just his head. Next, he takes two iron bars and breaks them over his head at the same time. Shi says that move is a demonstration of something called qigong. "It's about internal energy, being aware of internal energy, learning how to cultivate and utilize it," said Shi. The virtues that Shi teaches his students as part of Shaolin don't just stop in the classroom. Several of his students counted off how the teachings have made it into other areas of their lives. "It definitely helps me with my school work," said Jonas Kauffman, 10, who is competing in the Shaolin festival with his mother, Ciela Kauffman. "It helps my focus at school. I'm a lot calmer now than I used to be and it's helped my physical strength a lot," he said. Shi says his hope is that learning Shaolin, and competing in this festival, will boost his students' confidence. "Regardless of how they do, they will accept it and they will come back more confident and more sure of themselves, because how many people get that kind of opportunity to do something like this, and also represent Canada?"